So i have a serious craving for chocolate, sugar, anything sweet really. And i'm a horrible baker because lets just say i'm not the greatest at following direction. but for once I followed thoroughly & had success with these coconut cocao cookies. I've really been into cooking with coconut flour because it has protein, lots of fiber, and is grain free! but i also just really enjoy the taste and texture of coconut flour. Preheat the oven to 350 degrees F. Line a cookie sheet with parchment paper. Place the peanut butter, coconut oil, and coconut sugar in the bowl of a food processor fitted with a steel blade. Process until smooth. Add the eggs and vanilla and process again until evenly combined. Sprinkle the baking soda, cinnamon, and salt over the top. Sprinkle in the coconut flour. Process again until the mixture forms a smooth dough, stopping to scrape down the ball once or twice as needed. Using a spoon or spatula, gently fold in the chocolate chips. With a small cookie scoop or spoon, portion the dough by heaping tablespoons onto the prepared cookie sheet. With your fingers, lightly flatten the dough, as it will not spread during baking. Bake for 7 minutes or until the cookies turn barely golden brown at the edges and feel lightly dry. They will be very soft. 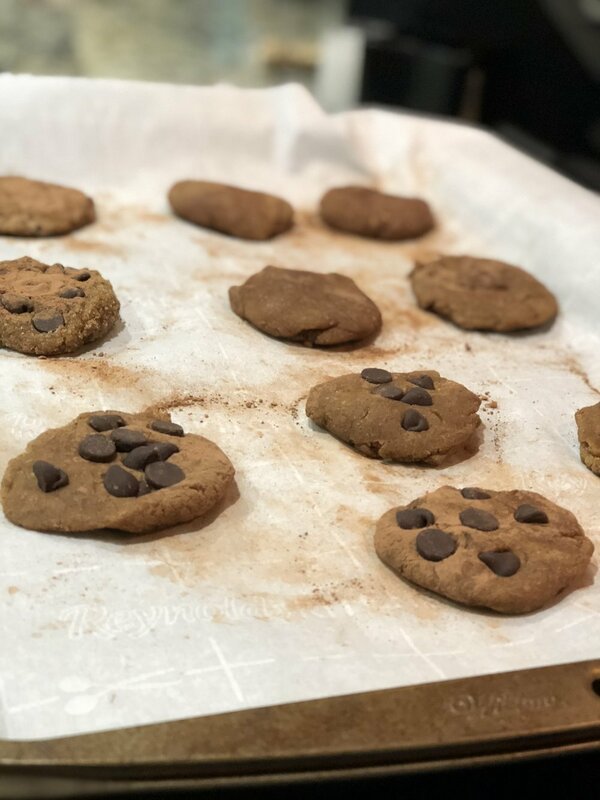 Let cool on the baking sheet for 3 minutes, and then transfer the cookies to a wire rack to finish cooling. Repeat with the remaining dough. I added Justins chocolate hazelnut spread and more coconut butter when they were hot, so it melted perfectly on top. or just add some of your fav chocolate chips and let them melt when you bake them!